A trait system affecting enemy creatures' resistances and weaknesses to magic (fire/frost/shock), physical damage (blade/blunt/axes/arrows), poison and disease. minor fix to allow KYE to work with merge plugins, does not affect gameplay in any way. All effects now applied as perks to NPC records (so no race record edits) for enhanced compatibility. Mod no longer affects vampires (again, for compatibility). Ghosts are now affected by bound, stalhrim, and dragonbone weapons (and Wuuthrad) in addition to silver, dawnguard, daedric and ghostly weapons, but are immune to disease and poison..
New trait "rocky". New trait "undead" replacing "dead". New trait "dwarven machine" replaces "metal". The vascular trait now brings a weakness to bladed weapons and a few tweaks to other traits to avoid crippling weaknesses. Changes the resistances and weaknesses of creatures and armor to magic and physical damage enhancing combat challenge and variety. 21 books to be found throughout Skyrim that unlock extra effects. Covers all vanilla armors, mage armor spells and enemies, except dragons and playable races. Modular: choose only the creatures module, only the armors module, or both. Compatible: Installs via a zEdit patcher for maximum compatibility. Lightweight: only a handful of scripts, none runs more than once. 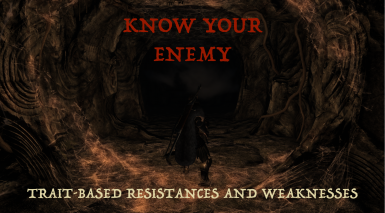 Know Your Enemy fixes Skyrim's repetitive combat by changing the resistance and susceptibility of different creatures and armor pieces to different types of damage. No longer will you be able to slaughter your way through Skyrim armed with only a single weapon or spell, instead you will need to flexibly adapt your strategy to the current foe. Armor effects will apply to both enemy NPCs and the player. So you can switch your attack style to deal with a tricky enemy, or change your own gear to withstand an enemy's attacks. Undead: Resist shock (50%), blade (x0.75), blunt (x0.25) and arrows (x0.25. Weak to axe (x1.25). Immune to poison and disease (-1000%). Cave dwelling: Resist poison (50%), weak to disease (50%). There's one last book that acts as an in-game introduction to the armor system. It can be bought from any blacksmith. Note: remember each creature can have multiple traits, to see the total effect for each enemy type scroll to the creatures section below. Furred creatures like wolves, bears and mammoths, are insulated against heat as well as the cold. Fat insulates creatures like the horker against fire and frost, it also dissipates blunt impacts. Being big gives creatures thermal inertia, providing weak protection against fire and frost. It also reduces damage taken from blunt weapons, axes and arrows. Small creatures like chickens and skeevers are vulnerable to extreme temperatures, making them weak to fire and frost. Arrows are particularly effective against the the delicate frames of small creatures. Armor protects against physical damage, particularly arrows. Axes are the best weapon to defeat an armored foe. Frost interferes with the steam engines that power Dwemer Automata, but fire supercharges them while they are immune to shock. The sturdy metal frame of Dwarven machines deflects arrows and bladed weapons, but it can be bent out of shape by blunt blows. The undead are immune to disease and poison, and without a functioning nervous system they are resistant to shock too. Blunt weapons and arrows do little damage to undead creatures like Draugr, they must be hacked apart ideally with an axe. Venomous creatures like the Chaurus are immune to poison. Creatures with a magical affinity for ice are immune to frost, but weak to fire. Creatures with a magical affinity for fire are immune to fire based magic, but weak to frost. Creatures with a magical affinity for electricity are resistant to shock damage. Living plants, like the Spriggan, fear the woodsman's axe above all else. They are also weak to fire and disease, but their wooden bodies can easily withstand blunt blows. The vile inhabitants of Skyrim's dankest depths are resistant to disease. Animated skeletons are hard to hit with arrows, and without flesh they are resistant to bladed weapons, fire and shock too. Troll blood brings with it a crippling weakness to fire. Subservient creatures like the undead and animated minions are weak to all kinds of magic.By domesticating them, humans tamed the wild spirits of animals, rendering them docile and weak to magic. The commanding power of certain magical creatures makes them resist all kinds of magic. Creatures than dwell in underground caves like the cold, being resistant to frost, but weak to fireLiving underground makes creatures vulnerable to diseases found on the surface, but feeding on mushrooms often found in caves gives poison resistance. The powerful hearts of ferocious beasts makes them fearsome predators, but weak to poisons. Aquatic creatures are resistant to fire, weak to frost, and devastated by shock. Brittle creatures will shatter when struck with blunt weapons, though arrows are also effective. Some creatures are not of this plane and are immune to all worldly poisons and disease. Creatures made from living rock are highly resistant to physical damage. Ghosts are immune to all physical attacks, except silver, daedric, dragonbone, stahlrim, dawnguard, bound and ghostly weapons. They are still affected by magic and weapon enchantments. Note that only the main armor piece effects resistances and weaknesses - gloves, boots and helmets don't matter. Again, I suggest you play the mod and try to figure out enemies for yourself, but for a bit more info I've added a pdf as an optional download that discusses the distribution of resistances and weakness across creatures in considerable detail. If you really want to know exactly how different enemies are affected open the spoiler below. The Dwarven sphere is not alive, it is powered by a steam engine housed within its armored frame. The Dwarven centurion is not alive, it is powered by a steam engine housed within its enormous armored frame. The diminutive Dwarven spider is not alive, it is powered by a steam engine housed within its delicate metal frame. The venomous chaurus lives in underground caves, its strong exoskeleton is a natural armor. The chaurus reaper is even larger and more dangerous that its smaller brethren. The chaurus hunter has sacrificed some of its bulk for increased mobility. The fledgling chaurus hunter is yet to reach full size. The ferocious gargoyle disguises itself as a statue in underground ruins waiting for unsuspecting adventurers. A being of pure frost, the ice wraith is physically frail, but magically potent. Peculiar magical entities brought forth by accident, these creatures are nonetheless vulnerable to blunt blows. A magical servant of pure fire, flame atronachs will ceaselessly serve their masters while in this realm. A magical servant of pure ice, frost atronachs will ceaselessly serve their masters while in this realm. A magical servant of pure electricity, storm atronachs will ceaselessly serve their masters while in this realm. Spriggan's are guardians and commanders of the forest, they will guard their land from any intruders. Trolls are physically imposing, but their troll blood gives them a weakness to fire. More powerful than their regular kin, frost trolls have a magical affinity for the cold, compounding their weakness to fire. Bears are large and ferocious predators that live across Skyrim's wilderness. Cave bears are large and ferocious predators that are found in Skyrim's many caves and mountain ranges. The snow bear's thick coat and insulating fat render it virtually immune to the cold. Small and brainless, the chicken is one of the least threatening creatures you will encounter in Skyrim. Small groups of semi-domesticated shaggy goats are found across Skyrim, both in farms and in the wilds. The cows thick fur keeps in warm as it grazes in Skyrim's open areas. Domesticated dogs are common in Skyrim, while friendly enough they lack the vital instincts of their wild cousins. Wilder than your average dog. Wild rabbits are common in Skyrim, although they are rarely seen as they avoid larger animals. Foxes are common throughout Skyrim, their fur protects against the cold, but they run from larger creatures. Spiders are a common threat, the exoskeleton is a natural armor and their venomous bite packs a punch. The thick layer of blubber under the skin of the Horker keeps them insulated and warm even along Skyrim's Northern edge. Groups of enormous giants lived scattered throughout Skyrim, while they usually ignore passers by, they will attack anything that threatens their mammoths. Domesticated by giants, mammoths are huge, with a thick coat and an even thicker layer of fat beneath. The semi-aquatic mudcrab is a common pest, although somewhat protected by an armored shell it is relatively defenseless. The speed and sterngth of the ferocious sabre cat make it one of the most terrifying beasts in Skyrim. Skyrim's horses are sturdy and reliable, their thick fur coat protects them against the harsh climate. In the far North, sabre cats have evolved thick coats and insulating fat to survive the harshest Winters. Skeevers are vile and filthy rodents that spread disease across Skyrim. Hagravens are disgusting creatures, once witches they have traded in their humanity for magical power. Skeleton minions are a favorite of necromancers, these hateful creatures will not rest while their masters live. Animated corpses, Draugr mindlessly patrol their underground prisons attacking anything that enters from above. Undead wolves with a magical affinity for ice, death hounds are subservient to their vampire masters. Even in death, the powers of the Dragon Priests cannot be contained and their appearance spells doom for any mortals they encounter. Deer are a common sight in the wilderness of Skyrim where they keep a watchful eye for predators. The slaughterfish prowls Skyrim's rivers and lakes looking for prey, it will happily take on swimmers who stray too far from the shore. The wispmother is a fabled magical being found in mountainous areas, it uses glowing wisps to lure travellers away from the road. The frozen chaurus has lain dormant, trapped within ice, waiting for its next victim. The vile Falmer dwell in perpetual darkness far below the surface of Skyrim. Packs of wolves hunt across Skyrim's wilderness, while weak individually, their numbers make them a threat. Oakflesh mimics the plant trait from the creatures module, its resistances/weaknesses are a mixed bag. Stoneflesh mimics a combination of the armored and brittle creature traits, its physically great. Ironflesh mimics the metal and thick armor traits. It's a beefed up version of stoneflesh, but is weak to magic. Weaknesses: fire x1.25, frost x1.25, shock x1.5. Ebonyflesh mimics the nonconductive armor trait, it has not physical effects, but is great against magic. - Download and install the mod into your data directory. Make sure know_your_enemy.esp is active. - Load your full load order, including know_your_enemy.esp. The position of the KYE esp does not matter. Note that if you have more than 256 plugins in your load order you should load only those esps that you want to be patched (i.e. those that modify or add new NPCs or armors). - Click to install a new patcher. Know your enemy comes with 2 patchers: one for the creatures module, and one for the armors module. They are added to your data directory with the esp, inside a folder called "zEdit patchers". Install one or both and then click the button to restart zEdit. - Silver Perk - if set to 'true' the patcher will edit the silver perk effects to be a little more interesting. This is potentially incompatible with other mods that edit the silver perk, hence it is 'false' by default. - Effect Intensity - a number the scales how dramatic the resistances and weaknesses are. 1.0 is usual, lower numbers (like 0.5) are 'lite' mode, higher numbers (e.g. 2.0) are 'insane' mode, negative numbers will probably break your game. - Patch armor descriptions - if set to 'true' (the default) a short description of the effects of the armor is added to the armors description and will be visible in your inventory. This is optional because it will hide the effects of any enchantments in your inventory, you will need to go into your active effects to check enchantments. - Load your full load order, including know_your_enemy.esp. The position of the KYE esp does not matter. - Build the patches you want (they take about 5 minutes each, longer if you have a long mod list). - Watch the logs as the patchers run, they tell you what the patcher is doing and give you warnings if something is up with your load order. - Note: do not use the build all function as this will create conflicts between the patchers. Instead build one, then when it has finished build the other. - Make sure the patches are below all the mods they patched. If you ran both patchers you want which ever you created last to be below the other. Delete the esps created by the patchers, install the new version of the mod, and re-run the patchers. Bear in mind updating mid playthrough is risky. Uninstalling mods mid playthrough is a bad idea unless you are very careful. KYE adds perks to the player, as well as to enemies and the there is a possibility for null references to remain after uninstall. If you want to do it though, it's straightforward: deactivate the esps and remove them from your load order. Here are some extra tips: uninstall in a cell with no enemies loaded, make sure you have no copies of the KYE books on you, use a save cleaner. Know Your Enemy is designed for maximum compatibility. As of v7, with the addition of zEdit patchers, it does not edit vanilla records until the patcher is run and so it is (technically) compatible with everything. Issues can arise with mods that add new kinds of NPCs/armors/resistances as the patcher might skip them, however, I have made the patcher robust to many common mods. Elemental Destruction Magic - you will need the mod 'Know Your Elements' if you want the new elements added by EDM to be affected by KYE, otherwise don't load EDM when the patcher runs. Heavy Armory - the added weapons use vanilla keywords and so will fall into the following categories. Shadow Spells Package - you will need "KYE Light and Shadow" if you want the new spells added by SSP to be affected by KYE. Bring Your Silver - the effects of BYS will stack with those from KYE making creatures like undead extremely powerful. If you are using KYE I wouldn't use BYS aswell. Daedric Entity Restoration Project - NPCs in new races will not be affected by KYE. Monster Mod SE - no KYE traits will be applied to the new NPCs added by MM. Plague of the Dead - I haven't bought it, so can't guarantee the patcher will patch the zombies. Revenge of the enemies - effects will stack with KYE making even tougher enemies. Adjust the patcher to add compatibility with more mods. 1) Why use traits instead of just giving each species its own specific resistance and weaknesses? Two reasons. First, traits that affect multiple species allow you to use past experience with enemies to guess at likely strategies for similar enemies. Second, traits combine in interesting and fun ways. Sometimes a creature ends up with an immunity, not from a single trait, but from how all its traits work together. Similarly, some enemies end up with crippling weaknesses. 2) Does this make the game harder? Yes and no. If you try to play like vanilla Skyrim and use a single strategy for all enemies you will probably find some enemies extremely difficult. If you use the spoilers above to see each species weaknesses you will probably find the game a little easier (though only a few enemies have crippling weaknesses and some have none at all). If you play the way I intend and experiment with different approaches you will find new enemies tough at first, but as you learn strategies to deal with them they will become more manageable. As you discover the books new approaches will open up too. This said, NPC AI does not take this sort of stuff into account so sometimes NPCs will have a very hard time. For instance, in one of the companion quests you are accompanied by Aela and Farkas etc and must fight ghosts. However, the weapons carried by these NPCs don't damage ghosts with KYE installed and so it will basically be up to you to kill the ghosts while the companions simply distract them. In another quest, you and Neloth (an NPC who mostly knows shock spells) fight dwarven automata, however, with KYE these are immune to shock so Neloth won't be much help. Nonetheless, these moments are few and far between, and when NPCs are your followers you can change their equipment strategically yourself (though you can't make the read the books due to an engine limitation). As such this shouldn't be a major problem. 3) Will this mod force me to play as a jack-of-all-trades? No, however single weapon builds are less viable with this mod. Instead you should invest in two or three different attack types. So you could combine blunt weapons with offensive restoration spells (from Apocalypse for instance). Or you could combine shock magic with poison and bows. You can certainly go for a pure magic or pure physical build though; combining swords and hammers should work well too. That said, depending on which skills you favor you might still encounter a few really tricky enemies. If you really want to remain a specialist, then another option is to use a complementary follower, someone with strengths against enemies you struggle with. 4) Do I need a bashed patch? No. The books are added to leveled lists at runtime via a script and so will be added to lists without the need of a bashed patch. 5) Where can I find the books? The armor book is sold by all blacksmiths, but the creature books are much rarer. They can be found in boss chests associated with human(ish) enemies (bandits, imperial legion, stormcloaks, forsworn, hagravens, vampires and mages). Different books are more likely to be owned by different types of enemy (e.g. mages are more likely to own magic-relevant volumes), but any book can be found with any of the above enemies. Each boss chest has about a 10% chance of containing a book but some are much rareer than others. In general I wouldn't expect you to find all 21 volumes until you get to a very high level. 6) What's the difference between KYE's armors module and True Armor? Can I use both? - KYE's armors module is script free, True Armor uses scripts. - KYE's armors module is has no MCM, True Armor has an MCM. - KYE's armors effects are flat resists/weaknesses, True Armor's effects are more complex and stochastic. - KYE's armors module is only based on the cuirass, True Armor takes all armor pieces into account. Try both and let me know what you think! 7) Why use a zEdit patcher instead of patching via esps? - Because KYE edits NPCs, without the patcher it would require lots of patches, this clutters up your load order. The zEdit patcher produces a single patch esp. - While esp patches resolve conflicts between a pair of mods, they exacerbate conflicts between more than 2 mods. Imagine you have already installed and patched AAE and SRCEO. If you tried to add KYE via patch esps this would reintroduce the incompatibility between AAE and SRCEO. With the patcher, once you have resolved the conflicts between AAE and SRCEO, KYE can be added on top without messing anything up. - Maintaining patches for constantly updating mods is a huge amount of work, the patcher will only rarely need to be updated. - The patcher will automatically accommodate most mods, while traditional esp patches only accommodate the mods they were built for. - zEdit allows patchers to have optional settings (e.g. adding optional descriptions to the armor), esp patches cannot be configured this way. Overall zEdit patchers are the future for mods that edit commonly affected records (like NPCs, races etc) and I am exceptionally grateful to Mator for providing the community with the ability to create them. 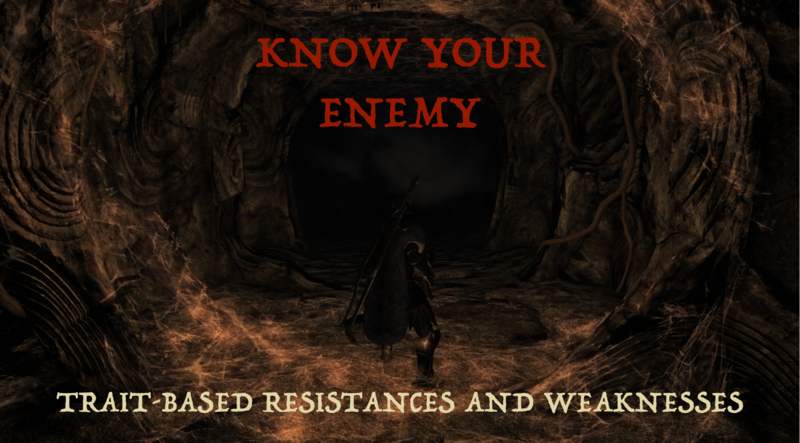 Know Your Enemy overhauls enemy defenses, but you'll probably want an enemy offense mod too. I use Skyrim Revamped - Complete Enemy Overhaul, but Advanced Adversary Encounters is another option (both are compatible with KYE). You should also pick up Mortal Enemies too and you might consider fixing up enemy combat AI, with smilodon, wildcat or combat evolved (all fully compatible with KYE). KYE gives you more reason to carry around multiple weapons, so why not show them off with a mod like visible favorited gear? You can also get a greater variety of weapons with a mod like heavy armory. Thanks to Mator for creating zEdit. It is an incredible tool that offers a solution to the "rule-of-one" that plagues modding. Special thanks to mooglerampage who helped with the design of the mage armor effects and who created Know Your Elements. Special thanks to Sthaag, /u/TendiesForBreakfast, Takahirn, sirjesto, sasnikol, SidePannel, thelegg77, SpaceOden, purplepharaoh, theCeige, novastark, OriginalDint and FeelTheBerne who have contributed to the development of this mod by providing patches. Extra special thanks to thelegg77 whose support has been tireless. Thanks also to tx12001 and sirjesto for their work on Advanced Adversary Encounters which was a major inspiration for this mod; the folks over at r/skyrimmods who offered feedback and encouragement, particularly Arindel who helped with adding books to leveled lists via a script and the 340 users who completed a questionnaire that helped me balance KYE; and, finally, thanks to Bethesda for making such an easily modded game that I can't put down.